Walk down the laundry aisle and you will find many products that will get the job done, and most people will grab any one of them without a second thought. But you aren't most people. Your house is your haven and you know your family and planet deserves better. Get a laundry detergent so natural it grows on trees! 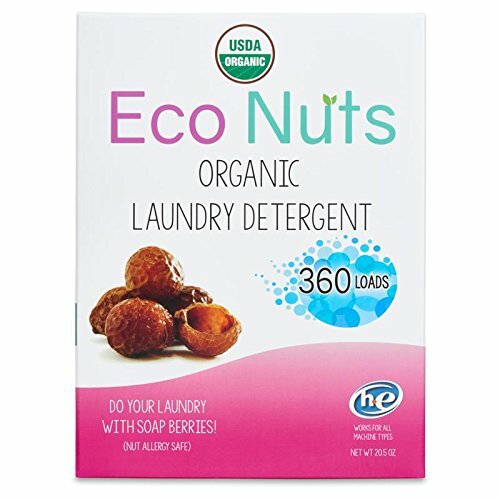 Eco Nuts uses USDA Certified Organic ingredients for the most effective, nontoxic, and sustainable laundry option available. With ethically harvested soap berries, recyclable packaging, and environment friendly thinking, Eco Nuts has created a detergent for families that care about the future. The Organic Laundry Detergent is a toxin free laundry option to keep clothes and babies away from harmful chemicals. Insects find the taste of the soap berries quite unappetizing, so they require no pesticides, chemicals or fertilizers for growth. Eco Nuts Organic Laundry Detergent is the only true nontoxic and sustainable laundry option. The skin is the largest organ in the body and it absorbs products that are applied to it. Eco Nuts Organic Laundry Detergent leverages the power of one of nature’s most powerful fruits to cleanse, soften, and refresh your clothes. Whether you have dry, sensitive skin or allergies and conditions, this detergent is the nontoxic and sustainable option for you, delicate enough for babies. Is your washing machine getting clogged with suds and soil? Call us nuts, but we want to expose the dirty truth behind commercial detergents which over sud and clog your washing machine. For a simply green clean that is easy on your washing machine, try Eco Nuts Organic Laundry Detergent. We care about our animal friends, land and sea. That is why our products are certified cruelty free by Leaping Bunny. We test our products on wool and maintain a mantra of compassion over consumption. All natural and organic cleaning options are our way of preserving the planet for the next generation. Join us in making the world a cleaner place. If you have any questions about this product by Eco Nuts, contact us by completing and submitting the form below. If you are looking for a specif part number, please include it with your message.